These gluten-free brownies are perfect to bring to baby showers or as a special treat for play dates. 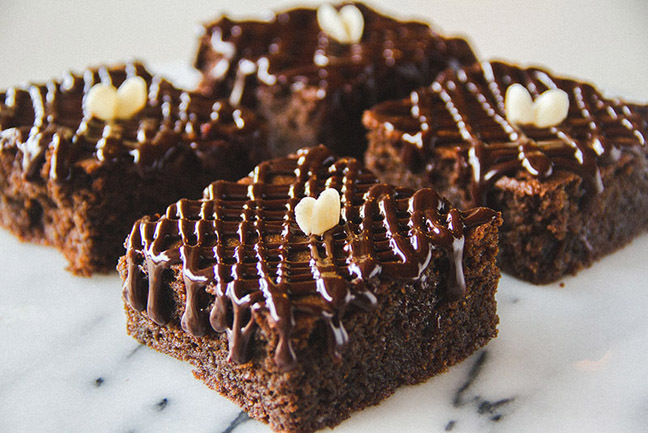 They’re rich and chocolatey, but made with almond flour, so they’re relatively healthy and great for groups where there may be gluten sensitivities. For a more individual gift, I love to cut these brownies into 2.5×2.5 inch squares, dust with powdered sugar, place them at the bottom of a cellophane bag, then tie it up with ribbon or twine. They make the perfect hostess gift! Keep reading for my BIRD Bakery gluten free brownie recipe. Step 1: Preheat oven to 300° with rack in center position. Generously butter a 9x13 inch baking dish. Step 2: In a double boiler, melt the chocolate and then remove from heat. In a large bowl, cream together butter and half of the sugar, slowly adding in the egg yolks. Once well incorporated, add flour and baking powder. Step 3: Place remaining sugar and eggs in the bowl of an electric mixer fitted with the whisk attachment and beat on medium speed—about 4 minutes—until stiff peaks form. Step 4: Slowly add the melted chocolate to the large bowl. Fold in the egg-white mixture until all of the ingredients are well incorporated, then pour batter into pan. Step 5: Bake for 60 minutes at 300°. Rotate halfway through, bringing temperature down to 275°. Bake until center is firm, being careful not to crisp the edges. Step 6: Let cool slightly in pan, about 15 minutes. Lift brownies out of pan and let cool completely on a wire rack before cutting. Step 7: Drizzle with chocolate ganache or dust with powdered sugar and garnish with one blanched, sliced almond. 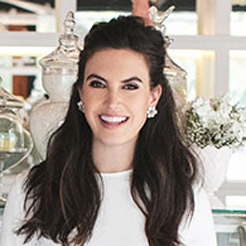 Elizabeth Chambers Hammer is a journalist and entrepreneur. She currently serves as Chief Correspondent for the Human Rights Foundation and is co-owner of the wildly popular BIRD Bakery in San Antonio, Texas.